I usually find myself most uninterested when pregnant women start pulling out a roll of black and white, grainy sonogram pictures showing off their upcoming bundle. I’m usually the one holding up the picture, squinting, turning it to the left, the right, upside down, right side over while oohing and aahhing when in reality I can’t tell heads nor tails of the dern thing. 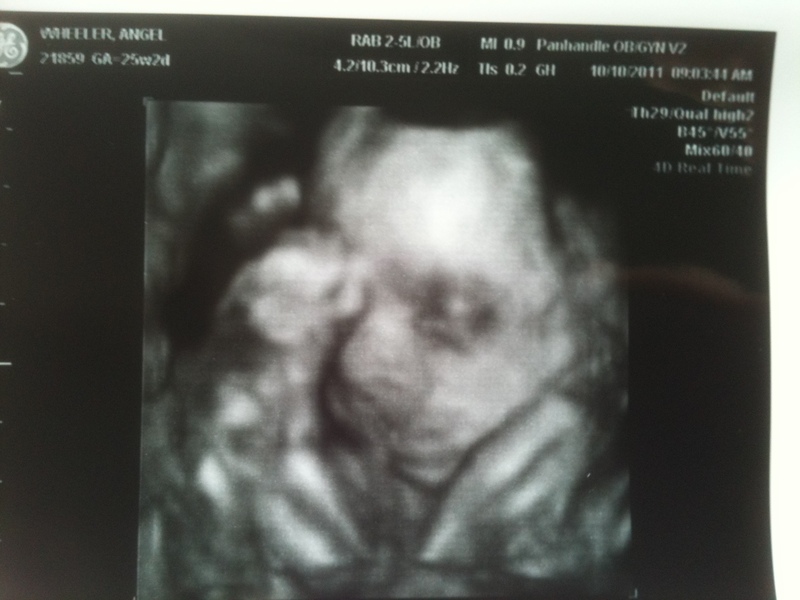 Even on my own sonogram, after I’ve plopped myself on that table, I have to tell the sonographer to talk me through it. So I know how you feel as I’m about to show you these pics of our little girl. Yes, girl. Nothing has changed. They still identified those three little lines that look kinda like a hamburger and said it’s a girl. Out of the approximately 18 pictures we got, there is only a couple that really show her sweet face, and I’m dying to share them with you, even though you may have to squint. Even then I can’t promise that her eye might just look a little like her foot. Meet Emma Kate (for now anyway). She has an absolute gigantic nose in this picture. But I’m sure its only the position of the camera, aren’t you? I don’t care. I can’t wait to kiss that big honker. In this little picture, the arrow is pointing to her open mouth. Her nose completely changed appearance, and I can’t help but say it, but she has my nose. In this picture anyway. J-Dub has this itty bitty nose which lacks those bulbous parts sticking on the side. Those are her feet up there by her head. She has folded herself up like a taco. 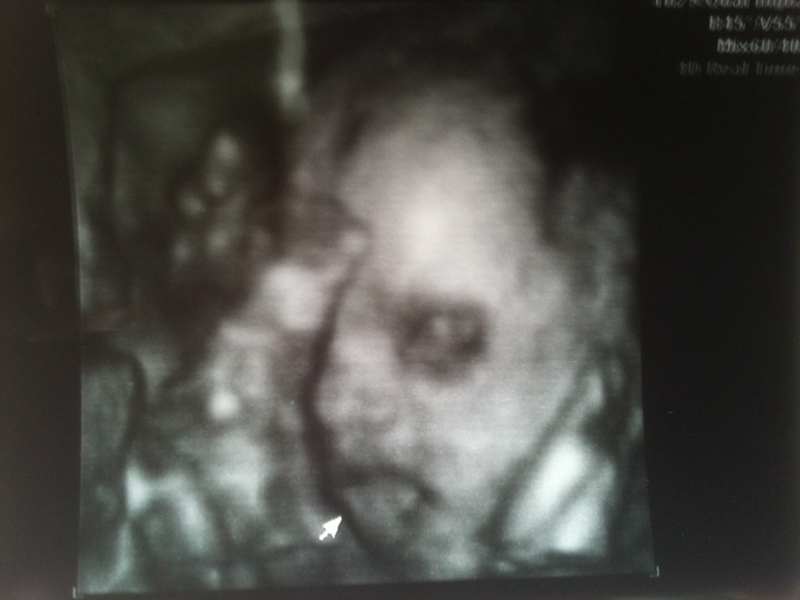 The sonographer tried to get her to move around, but to no avail, at which she commented how she is not easily irritated, which makes me happy to know. I hope she is never easily irritated. I am 25 weeks along today, and there’s only 15 more measly little old weeks to endure. The baby is weighing about 1.5 lbs (the weight of an average rutabaga….whatever that is) and is a little longer than a foot long sandwich from Subway. So far, everything is going perfect. God has blessed us through this pregnancy thus far and we are believing He will see us all the way to the end and then help us every step of the way raising her as we desperately try not to mess her up. Too badly. She is much loved already. And just so you know, these are the first of many pictures to come. She is a beautiful gift! Wish they had these kind of sonograms when I was pregnant! Thank you Mrs. Bromlow. She is a beautiful gift indeed. Thank you Angie!! Of course I think so too. my little niece is beautiful, cant wait to meet her! I can’t wait either…..but I can wait 15 weeks! I want her to bake as long as possible. Would it be odd if I said I see your Dad in Emma Kate? She’s adorable, Angel. Here is to a wonderful 15 weeks and her arrival. I can already see that she is beautiful! I am just so happy for y’all!! Wyatt was asleep during my 3D. She shook my belly and he gave a mad face and went back to sleep.